Athena West 9.0 Is Coming! We are excited to extend an invitation to Athena West 9.0 on Friday, December 4th at the 32 North Brewing Company from 1200-1500! For this event, we’ve made it easy for you to let us know you’re coming, thanks to Eventbrite. You can RSVP here. As the first Waterfront event in San Diego since the departure of USS BENFOLD, I am excited to be taking the reins from LTJG Tom Baker and the crew of the BENFOLD and I couldn’t think of a better home than LCSRON ONE for the Athena Project. As commands go, few spend more time trying to innovate than LCSRON ONE, as we work to develop and establish the revolutionary changes the Littoral Combat Ships represents for the Navy. But just because LCSRON ONE is focused in the LCS community, it doesn’t mean that Athena West 9.0 won’t be showcasing ideas from across the various communities of the Navy and beyond! As Athena continues to expand its reach throughout the nation and soon internationally, it is an exciting time here in San Diego as we look to draw on more and more ideas from a more and more diverse community. Athena West 9.0 expects to deliver a diverse group of ideas. We are always thrilled to connect with anyone who might be inspired by the Project and would like to get involved – message us if you’re interested! As always, the stage is 100% open to any innovators in the San Diego area, regardless of community or service affiliation, and we still have a couple presenter spots open! So, If you have a big idea that you want to share with our open and accepting network, get a hold of us and come on down to the event to share your idea with kindred spirits! We’re looking forward to an awesome event, and hope to see the Navy innovation community out in San Diego in two weeks! Get ready, Japan, Mayport and Groton! 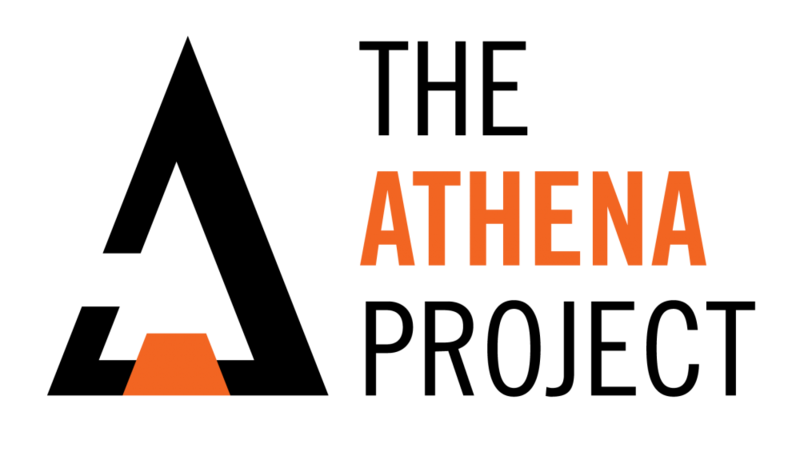 Athena events are coming your way soon! Want to know more – hit us up! There are lots of books available on innovation. There are formalized processes and approaches. Training classes. Many, many things to ‘prime the mind’ to a state of innovation. Is that all? Is that the only route to being innovative at work, and really, the underlying notion of being creative? In my day-to-day work I am fortunate to focus on innovation efforts. Sometimes the work is about process. Sometimes it’s about project management of that process. But luckily, there are plenty of opportunities to be creative. I grew up with a healthy influence of art in my life. Generally speaking quite a few family members are quite talented at a few different mediums. This certainly informed my choices to pursue art then, as well as now, as a hobby. The hobby got put to the side given demands of work, family and other hobbies like running. But a few years ago I rediscovered the joy of painting. What started as an opportunity to spend some quiet time in the evening has spread into an on-going opportunity to challenge myself, learn, take chances and ultimately increase the quality of my work – especially in regards to attempting to be innovative. Creativity has no limit – not a set amount, not finite. I don’t get exhausted composing new pieces to paint and working those pieces. A painting is never done – it just gets abandoned. Someone told me that is a Picasso quote. Not sure if that’s true, but the message is. So what does this mean for my work? How does it apply? Does it? Yes – my return to art has opened the aperture on what I see as possible. Why? How did that come about? 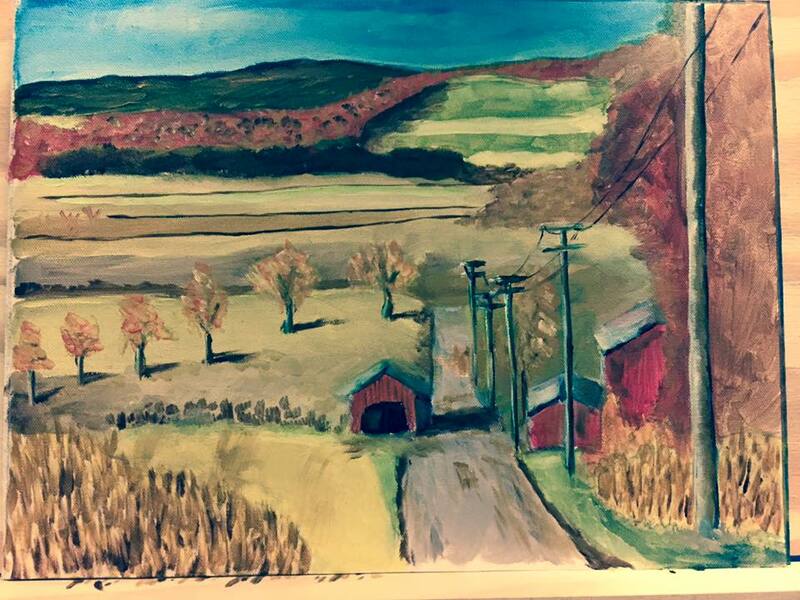 I’m much more willing to take chances – I dove back into art with faint memories of the tools, the techniques, etc. But I didn’t care – this was just a hobby, for me, on my own terms. So I start from that basis and just ‘go for it’ not worried about outcome. Along with that attitude I also post everything I do – good, bad, indifferent – on Facebook. I open up to a wider audience. Sure I get some off the obligatory likes and encouraging comments. But I also get some good reactions – especially over time as some of my FB friends have recognized I’m not looking for validation, rather I’m looking to share my art and let them react as they want. This is risky. It can bruise the ego (but for the most part is has been encouraging). Every opportunity at work presents an opportunity to grow in my craft. This is the same as art. 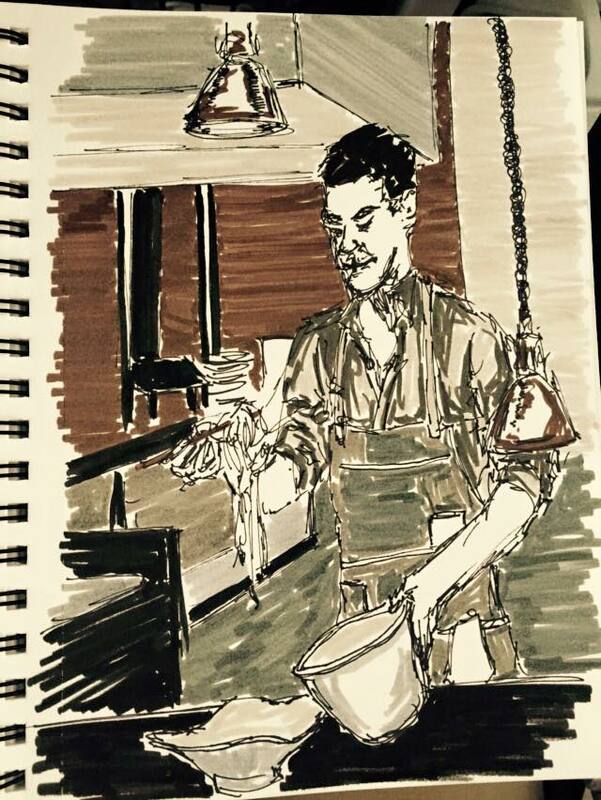 I have learned that sketching a subject ten times, painting it three times, etc. will result in variations in the product. The quality goes up with those iterations. It certainly creates an appreciation for iteration and adaptation. But it also creates a thread I can trace backwards – to see where improvements occurred, where the ‘a-ha’ moments were found, where a realization of what isn’t working presented itself. I’m free of the ideas and product – in short I’m completely comfortable tossing a piece in the fire. For one thing I have produced so much art work that it needs to go somewhere! But seriously, I don’t marry myself to any one piece, regardless of time and effort. Practice over time lets me move on to something else much more easily – recognizing the quality of a piece isn’t a reflection of the quality of me is important. Super important for being secure and self-aware (both of potential and limitations). Overall I’d strongly encourage pursuit of an art – it could be painting, sculpting, woodwork, quilting and on and on. But find some outlet for creative expression – you won’t run out of creative energy and that endless expenditure will build confidence in other ideas as well as your presentation of them. Dennis Smith is a member of the Design Thinking Corps at Johns Hopkins University Applied Physics Laboratory. His background is in User Experience Design. Learning how to break the proverbial box and create powerful ideas. The first athenaTHINK event east of the Rockies took place on October 30th at the Tom Steed Community Learning Center at Rose State College. 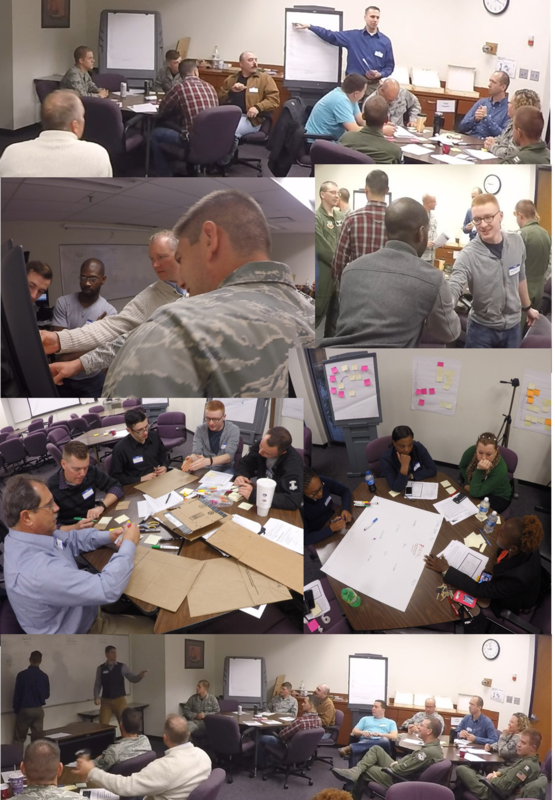 Creating a collaborative space for military members to innovate and support fresh ideas, over thirty military members from the Air Force and the Navy convened along with supportive members of the community for a three hour course of guided creative immersion aimed at equipping impactful ideas for action. Attendees learned design thinking, causation mapping, collaborative development, and how to leverage a supportive network. Providing feedback on the course leaving sticky-notes on the door, attendees remarked “Excellent Course!” “Loved Networking and Collaborative Element,” and “Thanks for the Valuable Tools!” Those who attended universally communicated a hunger for working alongside a diverse and collaborative group outside their normal work environment to solve difficult problems faced by all in the military. Fully involved in creative immersion! We continually focus on harnessing deckplate innovations to create a cadre of forward-thinking, creatively confident Service Members for tomorrow’s Military. Their next event in the Oklahoma City Area will take place in January and will be a pitch competition. Expect exact time and location to be posted here and to the facebook page (facebook.com/athenanavy). The athenaTHINK event is the first step in creating a collaborative community of military innovation in Central Oklahoma. Seeking to build synergistic and flexible avenues of support for service members with great ideas, we are bringing together elements from Navy units, Air Force units, a major maintenance depot, and hope to tap into area Army connections as well. Looking forward to where this community will go! LCDR Drew Barker is an E-6B Pilot, co-founder of ATHENA Northwest, and current uniformed lead of The ATHENA Project.